Victor M. Petitpain [Parents] [scrapbook] 1 was born on 25 Jul 1841 in New Orleans, Louisiana. He died on 23 Aug 1908 in Harris County, Houston, Texas. Victor married 1 Marie Knoblocia Knoblock on 25 Jul 1882 in New Orleans, Louisiana. Marie Knoblocia Knoblock [Parents] [scrapbook] 1 was born on 31 Jan 1848 in New Orleans, Louisiana. She was christened on 25 Apr 1849 in CIVIL, PROVIDENCE, PROVIDENCE, RHODE ISLAND. She died on 20 Mar 1931 in Harris County, Houston, Texas. She was buried on 21 Mar 1931 in Holy Cross Cemetery, Harris County, Texas. 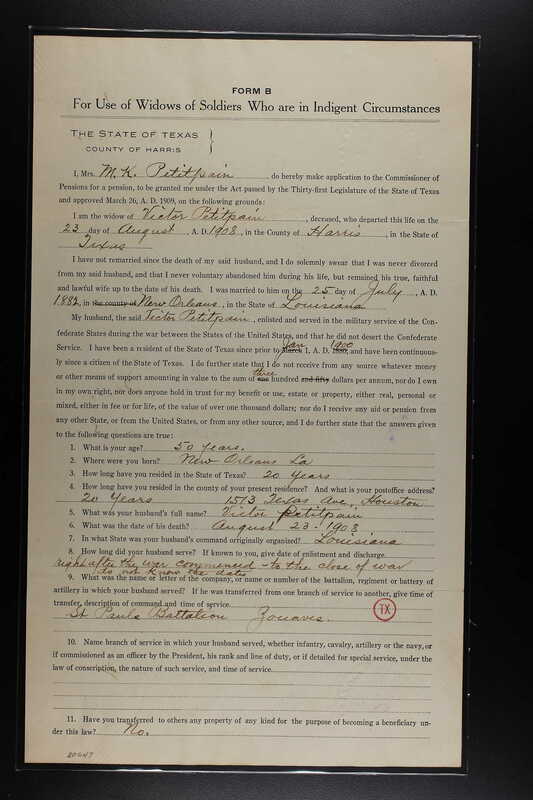 Marie married 1 Victor M. Petitpain on 25 Jul 1882 in New Orleans, Louisiana. Geronimo Zolezzi [Parents] 1 was born on 15 Aug 1818 in Caiavari, Genova, Liguria, Italy. He died in Unknown in Matamores, Mexico. Geronimo married 1 Maria De Los Angeles Lopez on 1 Feb 1848 in Matamores, Mexico. Maria De Los Angeles Lopez [Parents] 1 was born about 1824 in Matamores, Mexico. She died in Unknown in Matamores, Mexico. Maria married 1 Geronimo Zolezzi on 1 Feb 1848 in Matamores, Mexico. F i Maria Luisa Zolezzi was born about 1854. She died in Unknown. M ii Jaun Bautista Zolezzi was born on 17 Aug 1851. He died on 20 Mar 1931. Samuel Garcia Cuellar [Parents] [scrapbook] 1 was born on 1 Mar 1909 in C Muald, San Luis Potosi, Mexico. He died on 27 Oct 1987 in Cuauhtemoc, Distrito Federal, Mexico. Samuel married 2 Ana Santa Cruz. Ana Santa Cruz 1 died in Unknown. Ana married 2 Samuel Garcia Cuellar. M i Francisco Garcia Cuellar. 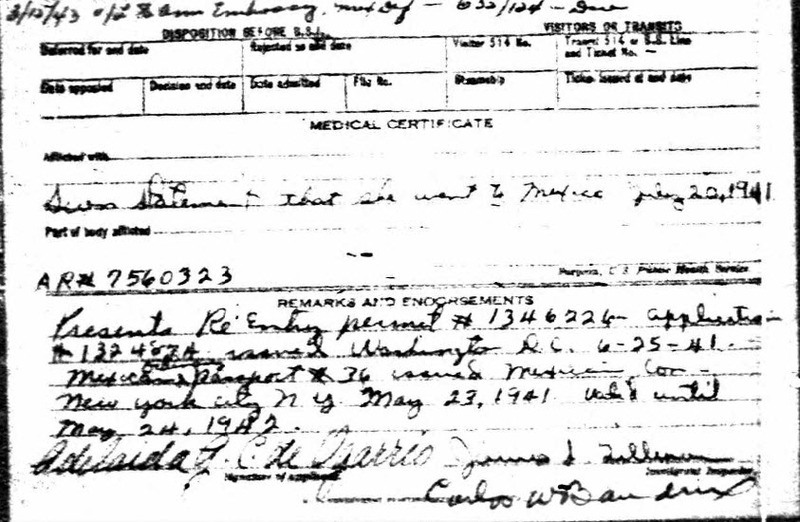 M ii Samuel Garcia Cuellar was born in Unknown. He died in Unknown. 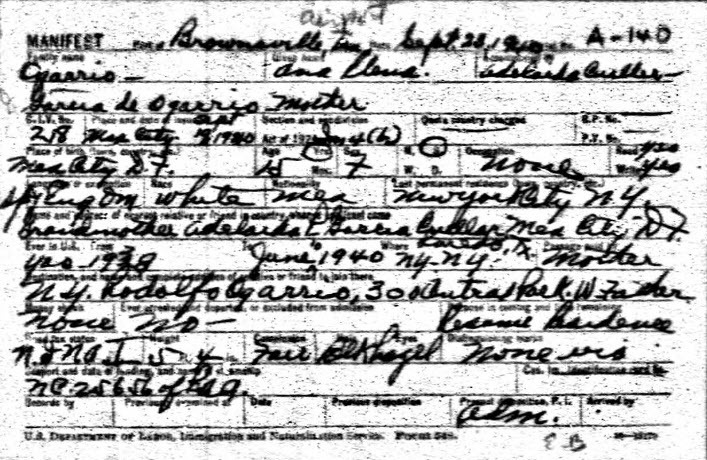 Rodolfo Ogarrio [Parents] [scrapbook] 1 was born on 21 Oct 1888 in Juarez, Chilurahina, Mexico. He was christened on 16 Nov 1888 in Chihuahua, Mexico. He died in Unknown. Rodolfo married 1 Adelaida Garcia Cuellar on 8 Oct 1923 in Manhatten, New York, New York. 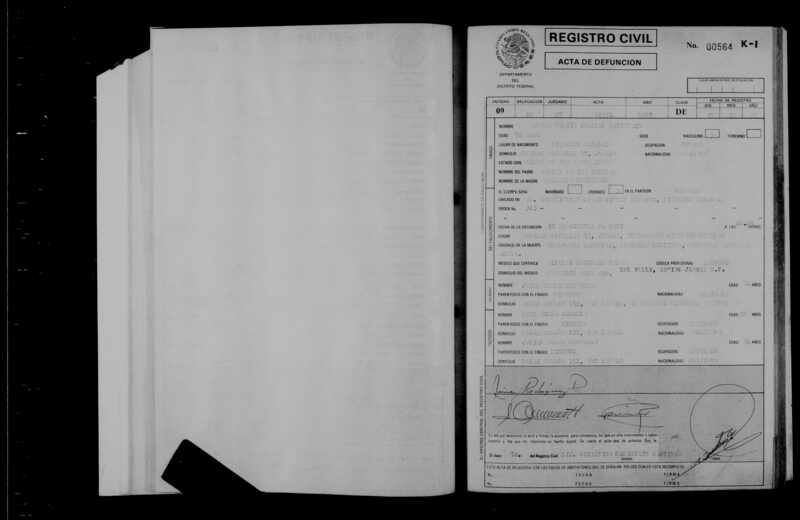 Adelaida Garcia Cuellar [Parents] [scrapbook] 1 was born on 29 May 1896 in San Luis Potosi, Mexico. She was baptized on 14 Jul 1896 in Nuestra Señora del Refugio, Matamoros, Tamaulipas, Mexico. She died on 3 Feb 1965 in Distrito Federal, Mexico. Adelaida married 1 Rodolfo Ogarrio on 8 Oct 1923 in Manhatten, New York, New York. Adelaida was baptized on 14 Jul 1896 in Nuestra Senora Del Refugio, Matamores, Tamaulipas, Mexico. F i Ana Elena Ogarrio was born on 19 Oct 1924. She died in Unknown. 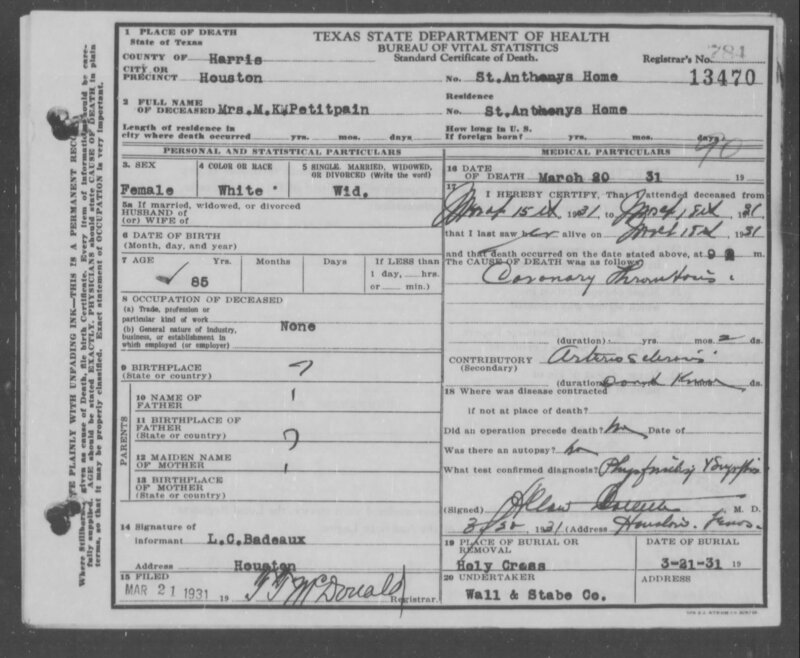 Samuel Garcia Cuellar [Parents] was born in Unknown. He died in Unknown. Samuel married 1 Maria Cespedes. F i Regina Garcia Cuellar Cespedes. F ii Jimena Garcia Cuellar Cespedes. F i Monica Garcia Cuellar Wood. F ii Adriana Garcia Cuellar Wood. M iii Arturo Garcia Cuellar Wood. Ana Elena Ogarrio [Parents] [scrapbook] 1 was born on 19 Oct 1924 in Mexico City, Mexico. She died in Unknown. Ana married 1 Ismael Reyes Retana. F i Ana Elena Reyes Retana. Louis Petitpain [Parents] 1 was born about 1692 in Croismare, Meurthe-Et-Moselle, France. He died in Unknown in Croismare, Meurthe-Et-Moselle, France. Louis married 1 Jeanne Poirson on 8 Nov 1718 in Vezelise, Meurthe-Et-Moselle, France. Jeanne Poirson [Parents] 1 was born about 1690 in Croismare, Meurthe-Et-Moselle, France. She died in Unknown in Croismare, Meurthe-Et-Moselle, France. Jeanne married 1 Louis Petitpain on 8 Nov 1718 in Vezelise, Meurthe-Et-Moselle, France. F i Anne Petitpain was born on 22 Jun 1724. She died in Unknown. M ii Claude Petitpain was born on 23 Apr 1726. He died in Unknown. Francois Petitpain was born on 16 Dec 1731 in Vezelise, Meurthe-Et-Moselle, France. She was baptized on 22 Feb 1733 in Vezelise, Meurthe-Et-Moselle, France. She died in Unknown in Vezelise, Meurthe-Et-Moselle, France. M iv Honore' Antoine Eugene Petitpain was born in 1755. He died in Unknown. Jean Claude Petitpain [Parents] 1 was born about 1671 in Croismare, Meurthe-Et-Moselle, France. He died on 12 Sep 1746 in Croismare, Meurthe-Et-Moselle, France. Jean married 1 Catherine Michel. Catherine Michel 1 died in Unknown. Catherine married 1 Jean Claude Petitpain. M i Louis Petitpain was born about 1692. He died in Unknown. M ii Franciois Petitpain was born before 1675. He died in Unknown. Jean Poirson 1. Jean married 1 Marie Serrier. Marie Serrier 1. Marie married 1 Jean Poirson. F i Jeanne Poirson was born about 1690. She died in Unknown.